As a healthy chef and wellness coach, I speak with a lot of clients on how to go about living a gluten free lifestyle. The information regarding gluten can be so overwhelming these days, not to mention confusing, but what it all comes down to is doing what's right for you. From weight gain, and bloating, to digestive issues and fatigue, gluten is being blamed for a lot of health issues. Many doctors have put their patients on gluten free diets, not mention the fact that being gluten free seem to have become a very popular health trend. For someone with celiac disease it's not so trendy, but rather a necessary alteration of their eating style. But if you're only playing around with the idea of going gluten free, I would say try it and see how you feel. Again, it all comes down to you taking control of your own health; it's about how gluten affects you. 1.Understand what gluten is and what to be aware of. Gluten is a protein found in wheat, barely and rye. You're probably thinking we've been eating these things for years, right? Well the gluten we eat today is not the gluten we ate years ago. We've since added new hybridized crops and 50% more gluten in common foods like breads and pastas. It is entirely possible that you can eat gluten without a reaction as long as it's from ancient grains like barley and rye. It might also mean that you are only sensitive to wheat, not all gluten. This sort of experience is typical if you travel to any European countries where wheat, barley and rye are less likely to be hybridized varieties. 2. Understand how your body responds to gluten. Really assess how you feel after you've eaten foods containing gluten, you might even consider keeping a food journal. For example, I begin to develop flu like symptoms after having consumed gluten. I get nauseated and experience stomach aches and soreness throughout my body, as well as, other symptoms. These are signals to me that I have a sensitivity to gluten, and because I don't like how gluten makes me feel, I choose not to have it. Keeping a food journal, or tracking of the foods you ate and how they made you feel can really help you get to the root of your food ailments. Becoming mindful of your food, as well as, your emotions and habits will ultimately help you on your journey towards a healthier, maybe even gluten free, lifestyle. 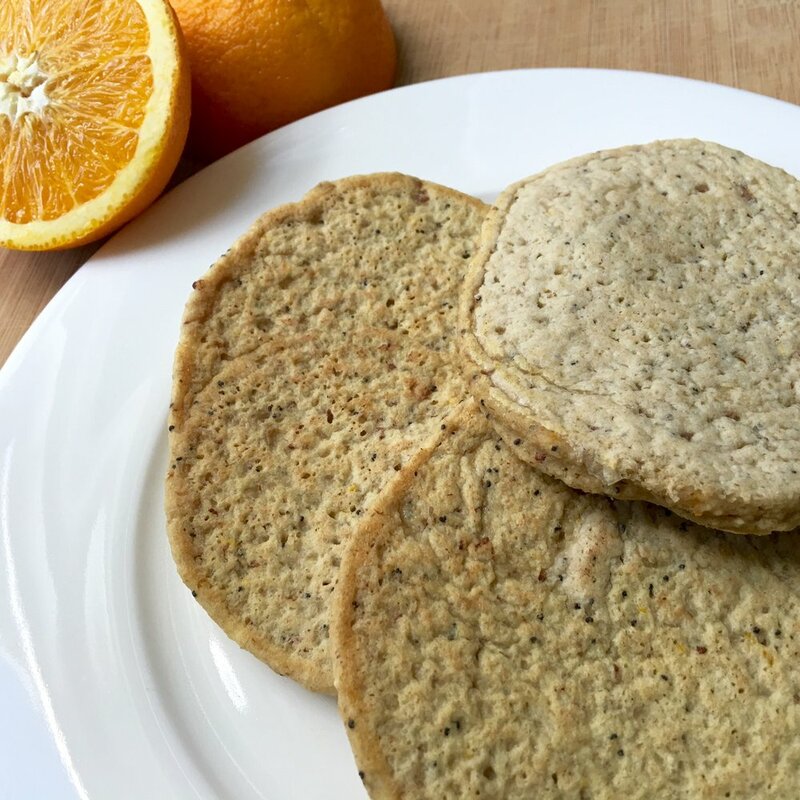 Staying motivated to eat this way is a dedication to your health, and what better way to motivate yourself than with a delicious stack of gluten free pancakes! Begin by grinding the oats in a blender or food processor to make your own oat flour. In a large mixing bowl, stir together the oat flour, salt and baking powder. Using a smaller, separate bowl together mix together the maple syrup, vanilla extract, orange juice, and coconut milk whisking until combined. Gradually add these wet ingredients into the dry ingredients, followed by the flax eggs and coconut oil (liquid) and mix well. Finally, add in the poppy seeds and orange zest. Let the batter set a 3 minutes or so to thicken up a bit. On the stovetop, using a lightly greased frying pan, set to medium heat, gently ladle out your preferred pancake portions. When the pancakes appear to be bubbling, give them a flip and let them cook for 2 more minutes. These pancakes are amazingly delicious and flavorful all by their lonesome but my family tops them in all different ways. I love sunflower seed butter and applesauce or coconut butter with berries. My husband is more traditional with grass fed butter and pure maple syrup. However you choose to top them, just enjoy them! 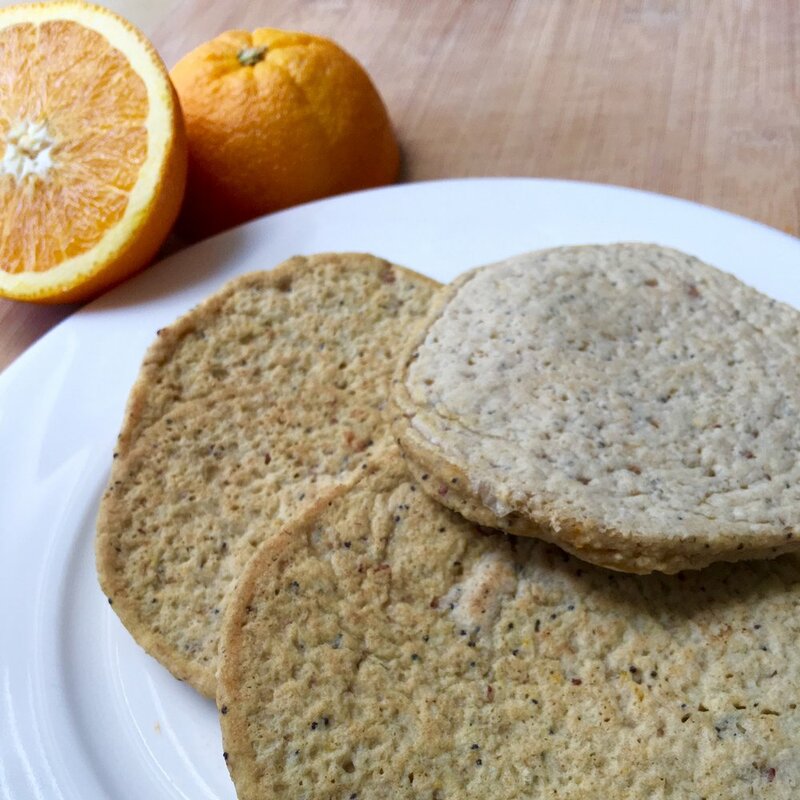 Substitution idea: If you want a grain free variety, you might try using tigernut flour!